Whether you imagine yourself as lord, lady, maid, cook or country house visitor you’ll delve in these pages into the daily routines of everyone from the scullery maid to the gardener. Complete with charming contemporary line drawings this fascinating guide will appeal to anyone who has wondered what it would be like to be served, or to be in service, in a grand country house. The size and splendour of a country house and its estate were undoubtedly a reflection of the status and ambition of its owner, and the whole was a self-sufficient world. 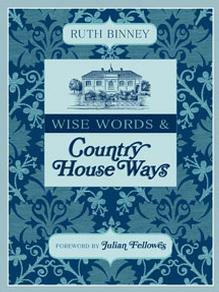 The details of the way in which the country house worked is reflected in the six chapters of the book, beginning with ‘Keeping House’ and progressing to ‘The Daily Routine’ and ‘The Country House Kitchen’. Since correct behaviour was so important to all activities of the house, ‘A Matter of Manners’ addresses the essentials of etiquette, a theme that also extends into ‘Leisure, Entertainment and Sport’, whether this was hunting, fishing or attending a ball or country house wedding. Finally, ‘Garden and Grounds’ focuses on everything from the cultivation of exotic fruit for the table to brewing and the care of horses and other animals.